In Episode #14, I touched briefly on how a cmd.exe user could hit the F7 key to view shell history, and we received a lot of positive feedback on that from folks. But, there's some more aspects of cmd.exe history that I use all the time that I think are worth bringing up here. ...can be very helpful to shoot your results to an evidence server somewhere. As we can see, the ipconfig command only appears in history once, even though we ran it three times in a row, due to this telescoping down effect. That last number there is a hexadecimal value for the number of commands you want it to remember. 0x400 will make it remember the last 1024 commands. This new history depth will only take effect when you launch new cmd.exe's going forward. But, you don't have to logoff or reboot for it to take effect. Just launch another cmd.exe, and you should have your new history depth (which can be viewed in the GUI by right clicking the title bar of a cmd.exe window, selecting "Properties", and going to the Options tab to view Command History Buffer Size). Oh, and another thing about cmd.exe history... I often see bashketeers get a little freaked out by how cmd.exe handles shell history when you scroll through it with the up-arrow and down-arrow keys. As we all know, you can hit the up-arrow key in cmd.exe to scroll back to a previous command in modern Windows machines. When you find the command you want, you can hit Enter to re-run that command. No problem there. The issue that puzzles some people is what happens after you've run that command from your history, and you then hit the up arrow key again. Let me illustrate it with this screen shot. Here, I've just hit 1 followed by Enter, to seed my history with some bogus commands so we can track things easily. Because there is no program called 1.exe, my shell tells me so. I do this for 2, 3, 4, and 5 as well. Then, I hit the up arrow key to scroll back to my 3 command. I hit Enter on that. If I hit the up arrow again, of course I get the 3 again. Now for the interesting part. What happens when I hit the up arrow again? If you were a bash guy, you might think that the system would display the number 5, because before you did 3, you did 5. And, you'd be wrong in a cmd.exe shell, which would display the number 2. What? Why 2? Well, cmd.exe maintains a shell history pointer, and when you scroll back into your history and then run a command from it, this pointer jumps back to your earlier command. 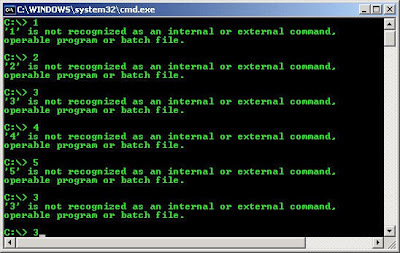 All up or down arrow movements from that point are relative to that older command, not your most recent commands. This used to flummox me, with my ancient Unix background. But, you know what? I'll share a dirty little secret with you if you don't tell anyone. I actually have grown to like (and... gulp... prefer) this behavior. You see, there is a certain locality of command execution from history, and, if I execute a command that was 20 commands ago, there is a reasonably good probability that I'll want to run another command from 19 commands ago after it. Oh, and notice that the bash history saves all of the commands you've typed, even the repeats. I think that's more useful-- especially from a forensic perspective-- than removing repeated commands, but I'm sure lord high doskey knows better than me. See the numbers next to the commands in the history output above? You can use "!<n>" to execute the previous command with number <n>. For example, "!1001" would execute "/etc/init.d.http restart" again (as would "!1004"). I often use this when I'm debugging a problem with a server process like Apache-- try to start the server and fail, enter a bunch of commands to fix the problem, "!<whatever>" to try and start the server, lather, rinse, repeat. In other words, "!<n>" is useful when you are constantly re-running the same command with an arbitrary number of other commands in between attempts. Wow, you can even set it in decimal! Crazy! What will those wacky Unix folks think of next?